Amazon has expanded its line of Kindle tablets yet again with this year’s version of the $US379 Fire HDX 8.9. The device, which is the same size as Google’s recent Nexus 9 and a bit smaller than the iPad Air, is one of the slimmest tablets you can buy. As is the case with its previous HDX tablets, the online retail giant is pushing its new addition as an entertainment-focused device. And with it’s gorgeous high-res display, it certainly has the hardware to pull it off. After spending a week using Amazon’s new tablet, here’s what I came away with. The 2014 edition of Amazon’s new tablet comes with a 2560×1600 resolution display just like its predecessor and the Nexus 9. There’s an 8-megapixel camera on the back and 2GB of RAM, which the company claims will ensure graphics run smoothly. In all honesty, there isn’t too much that’s different from last year’s model. The new tablet comes with Amazon’s new Firefly feature and runs on a new processor, but those are the only key differences. Amazon’s Kindle Fire HDX is undoubtedly one of the lightest tablets you can buy. In fact, it might be the lightest tablet at just 375 grams. By comparison, the Nexus 9 weighs 425 grams, the iPad Air 2 weighs 469 grams, and Sony’s Xperia Z2 tablet weighs 439 grams. Granted, both Apple and Sony’s tablets come with a larger screen than Amazon’s Fire HDX, but it’s still impressively slim. This makes it incredibly easy to use with one hand. The back of Amazon’s new tablet is made of a soft, slick material that’s resistant to fingerprints, which is a plus. Both Google and Sony’s tablet were quick to pick up smudges, so the tablets would look a little dirty after just a few minutes of use. 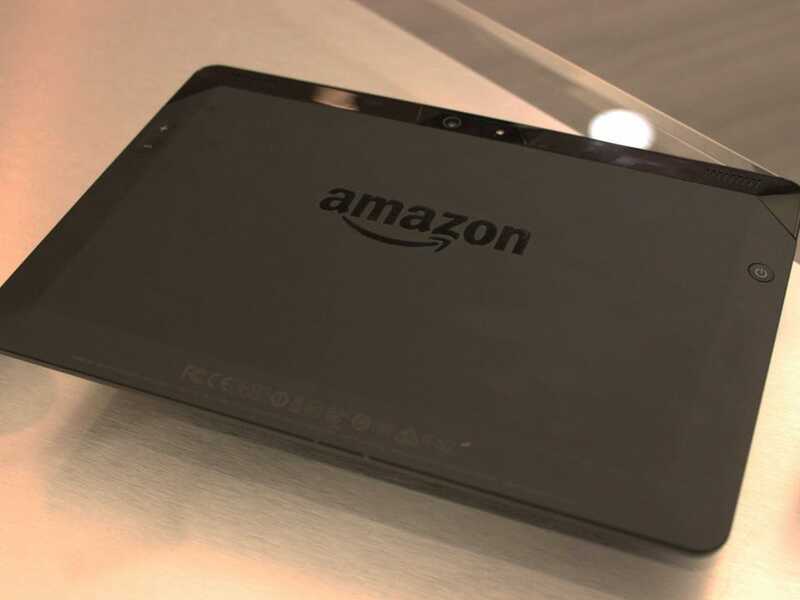 There’s one design quirk that has always confused me when picking up an Amazon tablet. Both the power and volume buttons are located on the back, rather than along the side. I understand it probably wouldn’t be possible to make the tablet super slim and light otherwise, but it always throws me off. Lisa EadiciccoThe Kindle Fire HDX has a great screen. 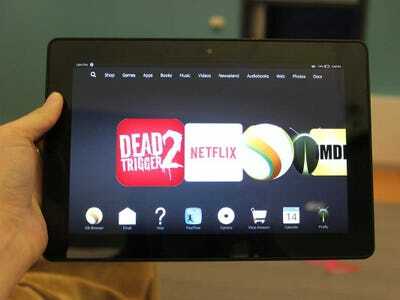 Like Amazon’s other devices, the new Fire HDX runs on its Fire OS — a modified version of Android. Although it’s technically based on Android, it doesn’t look very much like the software you’d see on a Google or Samsung tablet. The home screen consists of a carousel of app icons with a menu that sits across the top of the screen. The menu lets you browse different categories such as games, apps stored on your device, photos stored on the tablet, and more. Below the main carousel are a few icons for other options in the OS, such as Amazon’s Silk Browser, the stock email app, the tablet’s camera, calendar, and a few other choices. The carousel layout is a refreshing — it’s not the tired app grid layout you’ll find on most other mobile devices. 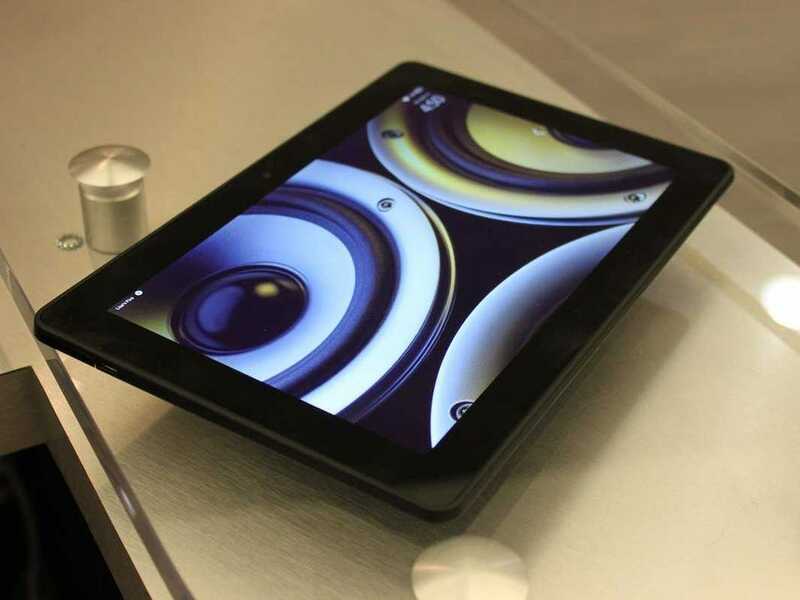 The Kindle Fire HDX 8.9 is a gorgeous, lightweight tablet, but it has its limitations. Although its an Android tablet, don’t plan on using Gmail, Google Maps, or any other Google-made application on it. There’s no access to the Google Play Store, which means if the app you’re looking for isn’t in Amazon’s AppStore, you won’t be able to use it. So, that means no YouTube, no Google Drive, and no Google Maps. Remember, the Fire HDX 8.9 is built for entertainment. So if you frequently use Amazon Prime and love downloading movies, you’ll probably enjoy Fire OS. Lisa EadiciccoThe new Kindle Fire HDX is super thin. Like its predecessor, the new tablet comes with Amazon’s Mayday feature, which is a service that connects you to a member of Amazon’s support team. Firefly is a newer Amazon feature that debuted on the Fire Phone last spring. Firefly allows you to use the device’s camera to scan barcodes on objects, business cards, and email addresses. Once the tablet recognises the object, it will either provide a link to save that person’s contact information or show a listing for that item in Amazon’s online store. Firefly works quickly and it’s incredibly accurate. Within seconds of holding a business card in front of the tablet’s camera, it pulled up that person’s phone number. The software reacted equally as fast when I held up the box for an iPhone case in front of the Fire HDX’s camera. Still, Firefly seems better-suited for a phone than a tablet. Whipping out a large handheld to scan a business card feels awkward. The new Fire HDX’s screen is gorgeous, too. Whether you’re doing some reading or watching Netflix, images and text really pop off the screen. It also seemed to be a bit brighter than the screen on the Nexus 9. 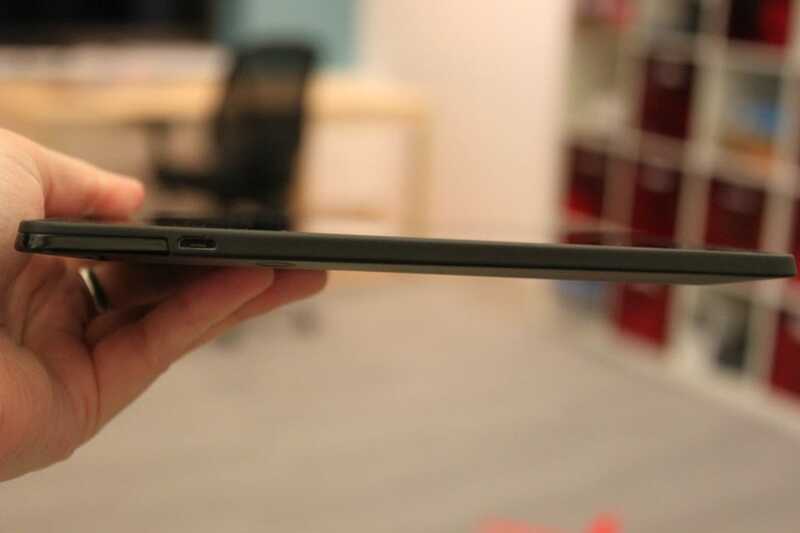 The Kindle Fire HDX’s battery lasts quite long on a single charge. I was able to get two full days of usage out of the tablet before its battery completely drained. This included streaming a lot of Netflix, playing games like “Dead Trigger” often, and browsing the web. Amazon’s recently released Kindle Fire HDX is an excellent tablet for reading and entertainment, especially if you use Amazon Prime a lot. It’s super light — in fact it’s one of the lightest tablets you can buy — and the screen is gorgeous too. But, you’ll have to be ok with giving up access to Google’s gigantic app store. Amazon has it’s own app store with more than 240,000 apps, although that’s a relative small number compared to both Apple and Google’s stores which offer about one million apps. And, if you’re used to using an Android tablet or an iPad, the software will seem a bit different on Amazon’s Fire HDX. If you don’t really care about apps and just want a tablet for streaming Netflix, reading, checking email, and browsing the web, you’ll be perfectly satisfied with the Fire HDX. Amazon has it’s own app store with more than 240,000 apps, although that’s a relative small number compared to both Apple and Google’s stores which offer about one million apps.